RAGE consists of one of the best looking single player FPS campaigns coming out this year and, with legendary developer id Software at the helm, it’s sure to blow our socks off this fall. It only makes sense then to make a great thing better, by putting out a special edition for the fans. RAGE blew us away at E3, with its smooth gunplay, awesome gadgets, and racing battles all rolled into one massive open world FPS. The creators of Doom and Quake are sure to maintain their solid footing as one of the best FPS developers out there, and it looks like they’re pulling out all the stops for the release. 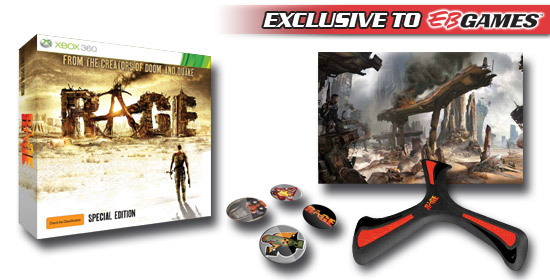 You may have already known that certain retailers like EB Games and Gamestop are offering up the Anarchy Edition of Rage in return for placing a pre-order now, but a special edition with even more goodies has just been revealed on EB Games’ Australian website. You can pre-order it now, for only $108.00, which nets you 3 special bonus items in addition to the Anarchy Edition’s DLC. Each pack will come with an individually numbered RAGE print, several gang badges, and a wingstick, which is one of the many gadgets found within the game. Wasteland settler design and ingenuity! Features compact form factor with plenty of muscle to take out everything from mutants, bandits and maybe even a lone Authority Enforcer. This is the most sought-after armor in the wasteland. Constructed of hardened plate armor, this gear was created specifically to withstand the toughest wasteland battles. It also features larger component storage, allowing you to carry more parts that will aid in the fabrication of advanced engineering items. A classic weapon for close quarters combat. When you’ve run out of ammunition and fists are the only option, these razor sharp knuckle blades will give you that combat edge. Improve your odds of survival in the wasteland with this vehicle that comes equipped with a front smash guard and durable protection. Some of that stuff sounds pretty awesome, and personally I’d be after that elite armor for the extra component storage. You’ll definitely want that, since the wasteland is full of components that let you cobble together various gadgets like wingsticks, spider turrets, and explosive RC Cars for devastating all enemies that stand in your way. The Anarchy Edition itself is now available as a bonus through pre-order at EB Games and GameStop. This is supposedly available everywhere, but a quick visit on Amazon reveals that they mention nothing about the pre-order bonus, so if you decide to pre-order elsewhere, be sure to check with them about the Anarchy Edition bonus. RAGE is currently scheduled to release on October 4th in North America and on October 7th in Europe.